Is there a way to have index.html functionality with content hosted on S3? A call to www.example.com/index.html works great! But if one were to call www.example.com/ we'd either get a 403 or a REST object listing XML document depending on how bucket-level ACL was configured. So, the question: Is there a way to have index.html functionality with content hosted on S3? The index document for a bucket can be set to something like index.html. When accessing the root of the site or a sub-directory containing a document of that name that document is returned. If you use the first, it will not work as intended, no matter how much you config the Index document. To get your true website address, go to your S3 Management Console, select the target bucket, then Properties, then Static Website Hosting. It will show the website URL that will work. You can easily solve it by Amazon CloudFront link. 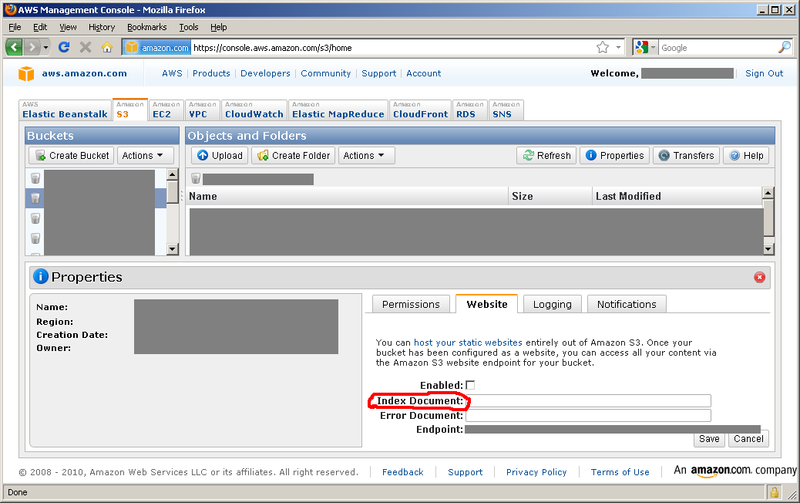 At Amazon CloudFront you could modify the root object. You can download manager here: m1.mycloudbuddy.com/downloads.html. 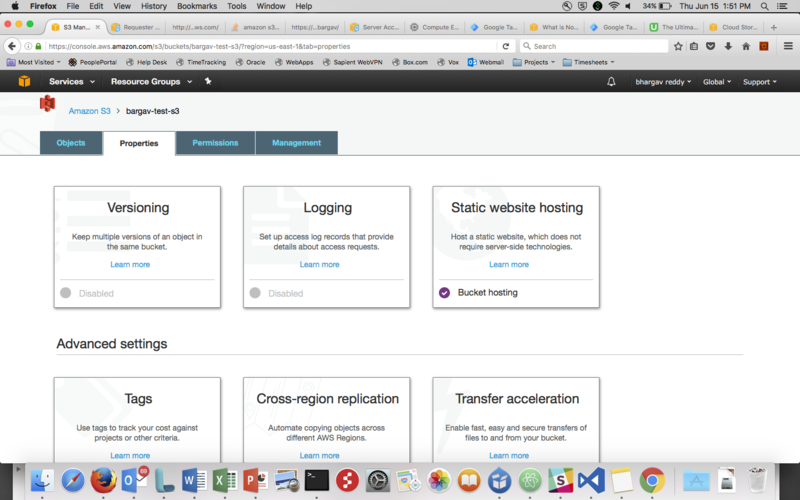 Since It's been long time, this question being asked, and Amazon S3 changing their Interface. I would like to answer with updated screenshots. 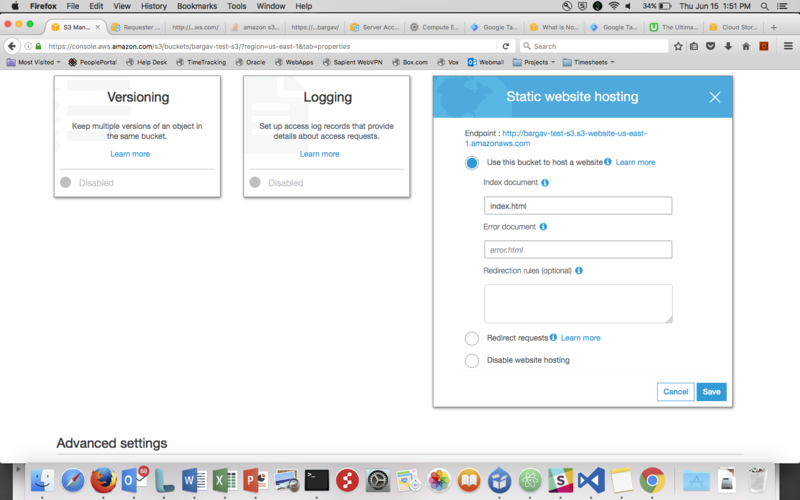 We need to enable 'static web hosting' for S3 to serve as webhosting. - Go to Properties -> click on static web hosting -> Select 'use this bucket to host a website' - Enter the index document (index.html by default), error document and redirection rules, if any. I would suggest reading this thread from 2006 (On Amazon web services developers connection). It seems there's no easy solution to this. Yes. using AWS Cloudfront lets you assign a default file. www.example.com forwards to http://www.example.com.s3.amazonaws.com and make sure you cloak the output. Not the answer you're looking for? Browse other questions tagged amazon-s3 amazon-web-services or ask your own question. Received S3 bucket security notification email for my AWS account? Cloudflare how to set default object when using S3 backend?